This lively talk offers a unique opportunity to gain insight into the work of Fernand Léger. Hear from Dr. Lauren Arrington, Professor of Modern Literature at the University of Liverpool, as she discusses Léger's interest in using the human form as a complement, or juxtaposition, to the mechanical or architectural motifs seen in his work. The talk will also explore why the human form was such a distinct choice of subject for many European artists and writers of the mid-1920s. 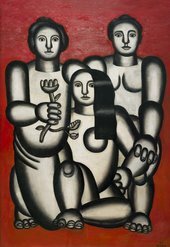 See Fernand Léger's work on display in Fernand Léger: New Times, New Pleasures at Tate Liverpool.